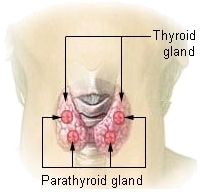 In our body's neck, the Thyroid Gland, located inferior to (below) the thyroid cartilage (adam's apple) and at approximately the same level as the cricoid cartilage, is a small (weighing less than one ounce), butterfly-shaped endocrine gland consisting of two lobes connected by an isthmus, ,situated at the front and sides of the neck, anterior to the trachea, just inferior to the larynx, and behind the sternohyoid and thyrohyoid muscles. In our body, Follicles (Thyroid Follicles) are spherical structures that make up the thyroid gland that contain a gel-like colloid surrounded by a single layer of cells, which secrete thyroglobulin into the colloid. In our body, Goitrogens (Antithyroid Agents) are exogenous substances that suppress the function of the thyroid gland (as a thyroid antagonists) by reducing the excessive production of thyroid hormones. In our body, Goitrogens (Antithyroid Agents) as exogenous substances suppressing thyroid gland function, often by interfering with iodine uptake.